Over the years, Soil Born has evolved, says cofounder Shawn Harrison, with one recent shift involving the organization’s approach to youth education — and making sure they close the gaps between the first time a child is exposed to growing healthy food in gardens, the second and third time, and so on. The group used to take a shotgun approach when accepting campuses in the target area of south Sacramento into its school garden program. But if the garden’s lessons in, say, ecology, nutrition or agriculture are to be truly effective, students need to avoid the gaps in education that can cause them to lose interest or forget what they learned. Now, Soil Born more carefully selects the campuses they accept into the program to ensure stronger educational pathways. For instance, they oversee the garden at Pacific Elementary School in a food desert in south Sacramento; those students feed into Fern Bacon Middle School, which Soil Born has in its garden program. According to Soil Born School Gardens Manager Shannon Hardwicke, Pacific alumni at Fern Bacon immediately asked their teacher to start a garden club. 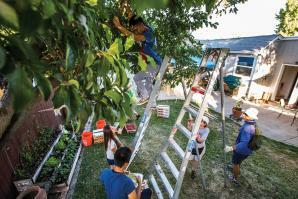 “It was student-led: ‘Hey, we want to keep doing this.’” These students then typically attend Burbank High School, which has its own urban garden program. This closes the gaps. On a school day in June, Pacific students harvest potatoes to cook and eat at lunchtime, and lettuce and onions to toss into a big salad. When the garden’s apricots recently ripened, students devoured them, Hardwicke says. Children are always asking to eat whatever is allowed, and digging in the dirt seems to make them eager to taste unfamiliar produce, Hardwicke says. On this particular day, four second-grade girls come in during recess to help harvest lettuce and do a scavenger hunt to uncover potatoes hidden in the soil. Hardwicke asks them why they like the garden. They shout out responses: It’s beautiful. Healthy. They get to play with the plants. And, of course, the rollie pollies. Soil Born manages six school gardens within the Sacramento City Unified School District, which are mainly funded through the California Endowment’s Building Healthy Communities initiative. The 10-year, $1 billion initiative identified 14 high-risk communities throughout the state where groups could collaborate to improve health outcomes, and ends in 2020. The organization also oversees four gardens in the Folsom Cordova Unified School District. Way to go Soil Born. 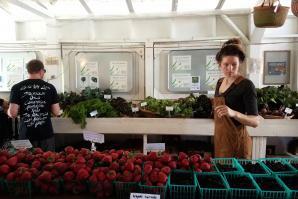 “Eat local.” You’ve heard the phrase a billion times. It’s the guiding principle of the farm-to-fork movement, nudging us away from the Industrial Food Complex and toward our neighborhood farms. But there’s something even more local than a ranch down the road: the orange tree in your front yard. The Sacramento region’s urban farming movement keeps growing and growing, but the two farms that started it all — Soil Born Farms and Yisrael Family Urban Farm — remain the hub of the activity. Both farms focus on education as critical to expanding the movement even more, and giving residents old and young the know-how and tools to grow their own food.